Punjabis challenged their exclusion and legal status in the U.S. by filing petitions in courts and lobbying in Washington D.C. At the same time, they were concerned with the political turmoil in India. They supported efforts to challenge British rule there, often citing America’s own struggle for independence. The community, though small in numbers, organized itself and provided funds for both issues. 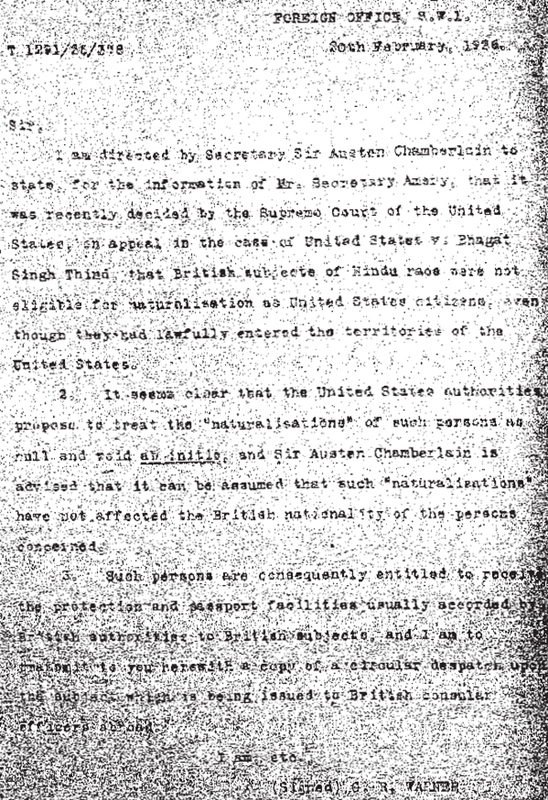 Letter from Secretary of State, Foreign Office; Hindu Race (people from India), not suitable for US citizenship (February 20, 1926). © 2019 Punjabi American Heritage Society. All Rights Reserved.